↑ Walker, Samuel (1977). A Critical History of Police Reform: The Emergence of Professionalism. Lexington, MT: Lexington Books. p. 143. ISBN 978-0-669-01292-7. ↑ Neocleous, Mark (2004). Fabricating Social Order: A Critical History of Police Power. Pluto Press. pp. 93–94. ISBN 978-0-7453-1489-1. ↑ Beam, Christopher (2009-06-17). "Prints of Persia". Slate (in ਅੰਗਰੇਜ਼ੀ). ISSN 1091-2339. Retrieved 2017-08-30. 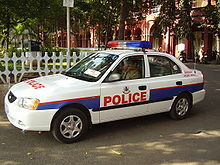 ↑ "Why is the colour of the Indian police uniform khaki?". The Times of India. 3 March 2007. Retrieved 2010-05-11.